metal bin in the pump house at his Plainfield sugarbush. CANTERBURY, Conn. - After checking the sugarbush* on a partly sunny, 36 degree day, Tony Denning, owner of Maple Leaf Farm, drove past a small grocery store on his way back home. "They have my syrup on the shelf next to Log Cabin in there," he told me. "Do you know what's in Log Cabin?" I guessed corn syrup, the most overused substitute for sugar mass retailers can find. "Let's go find out," Denning said, and he pulled his truck into the parking lot. Sure enough, the Log Cabin bottle was right next to the quart from Maple Leaf Farm. Coyly coined "table syrup," the ingredients list does not include corn syrup as I suspected, but brown rice syrup. Denning's quart is nothing short of the real thing: 100 percent pure maple syrup. The "sugaring season" is a short one, and maple syrup producers like Denning need to make the most of a limited time window - typically six weeks before rising spring temperatures end the season. "Maple syrup production [in Connecticut] is so under done," he said. He's right. Connecticut made up only 1 percent of the entire maple production in 2013, according to the United States Department of Agriculture, and it's not due to the lack of trees. For maple syrup production, the trees need temperatures in the low 20s at night and 45 degrees Fahrenheit during the day to help the sap flow. "You want the trees to freeze all night. Not for an hour or two in the morning - that doesn't cut it," he said. In the past five years, maple syrup production at Maple Leaf Farm has started as early as Jan. 6 and as late as Feb. 14. "Last year was better sugar content. Everything came off right last year," Denning said. This year, the season didn't begin until Feb. 21 for Denning. This delay in the start of the season was thanks to the extreme cold temperatures - known as the "polar vortex" - Connecticut experienced this year. "We've only had two really good runs this year," he said. "This year we are just throwing the rulebook out - nothing is happening the way it should be happening. This is the latest I've ever started in the season. [And] I've never seen it run past the first week of April." When trees are originally tapped, the sap runs clear, resulting in lighter colored maple syrup. As the season continues, the sap takes on more color. "The warmer the temperature is, the darker it usually is," he said. "[But] this year we didn't make any light syrup." 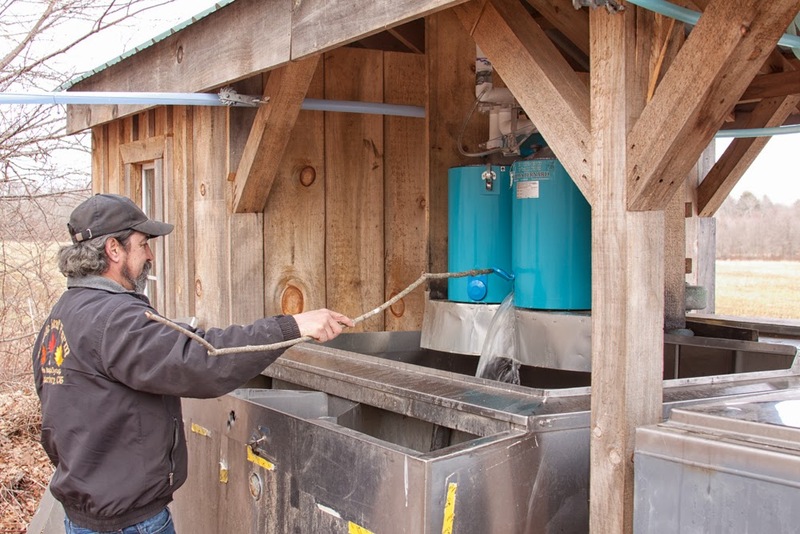 At Maple Leaf Farm, maple syrup is created with a machine that uses reverse osmosis to separate the water from the sap. It is then funneled into an evaporator and heated to a temperature between 219 and 223 degrees Fahrenheit. "I like my syrup thick," he said as he offered me a shot of maple syrup. I happily obliged - it was thick and sweet. "Everybody wants dark syrup," he said. "The darker the syrup, the more flavor. The lighter the syrup the lighter the flavor." Dark syrup also has more beneficial properties than light syrup. 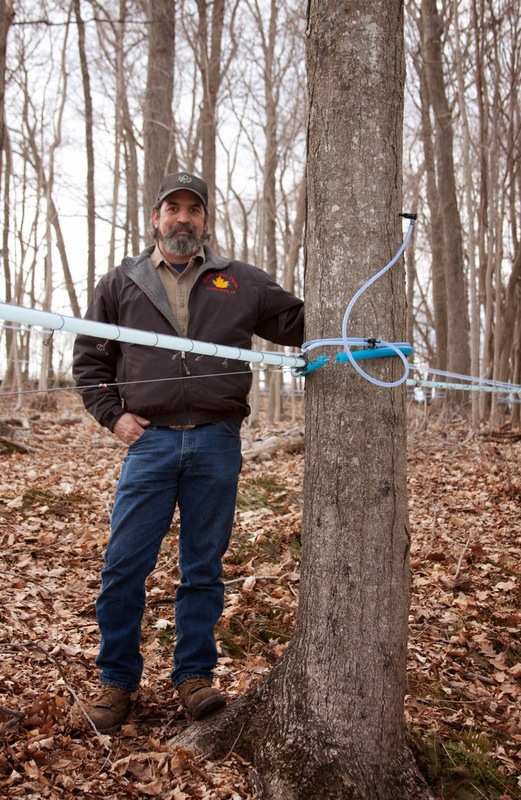 Less than five years ago, a University of Rhode Island scientist discovered that pure maple syrup from Canada contained 54 beneficial properties. According to URI, "several of these anti-oxidant compounds newly identified in maple syrup are also reported to have anti-cancer, anti-bacterial and anti-diabetic properties." Maple syrup inventory at Maple Leaf Farm in Canterbury, Conn. The USDA grading system that Connecticut uses is classified into Grade A light amber, medium amber and dark amber. There is also Grade B and commercial grade, which is darker than Grade B. Now the system is changing. Maple syrup is produced throughout Canada (mainly Quebec) and the northeast portion of the United States. According to Cornell University, "syrup flavor is affected by soil type, tree genetics, weather conditions during the maple season, time during the season when the sap is collected and processing technique." Denning said he likes the solitude of the woods, which is a good thing because the sugarbush requires constant maintenance. "I do it all myself, " he said. "If it was easy, everybody would be doing it." 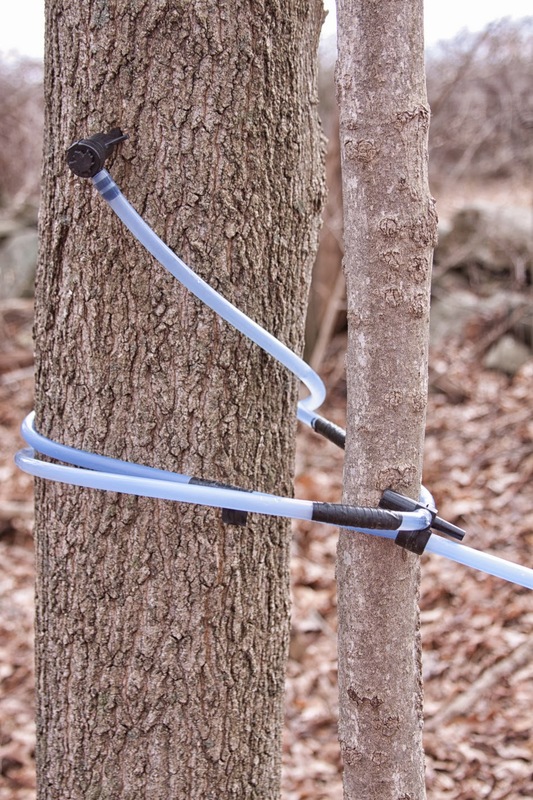 Five years ago, Denning started tapping trees for Maple Leaf Farm. The following year he switched to a vacuum pump system to collect the sap. 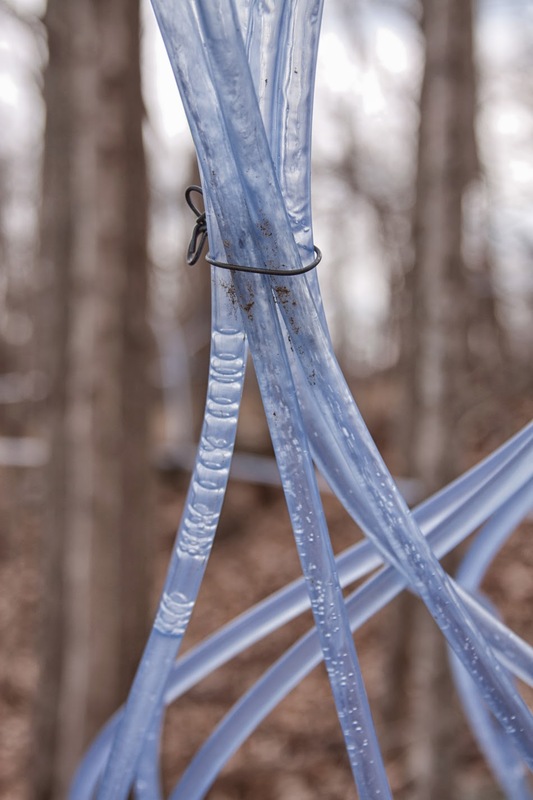 Each tree is tapped and connected with tubing. The tree's individual tubing is hooked up to the main vacuum line. "With a vacuum system you bring all the sap to where you want it," he said. Between his three sugarbush locations spread over 20 acres, he has 2,000 taps on the vacuum system. On site, all the sap from six acres of trees comes to the sugar house, which he built himself. The other two locations have a pump house set up with tanks to collect the sap. The trees need to be tended to daily. Lines in the vacuum system can be nibbled on by squirrels. They aren't the only animals with a sweet tooth. Raccoons, opossums and even young coyotes chew on plastic tubing used in the vacuum system "You know it's a coyote pup [when] it's ripped right to the ground and chewed on," he said. Deer, which also frequent the woods, leave the lines alone. "The bigger the trees are the longer it takes them to thaw out," said Denning. Tapping the trees for the sap does not hurt the tree. When tapping a tree, the diameter of the tree trunk determines how many taps can be used. (Up to 18 inches in diameter, 1 tap; 18 inches to 2 1/2 feet, 2 taps; 3 feet or larger, 3 taps.) Any type of maple tree can be tapped, not just sugar maples, although the sugar maple is the most popular due to its high sugar content. "They want to go," he said, referring to the sap in the trees. "They want to run." Maple Leaf Farm is open Monday through Friday, 2 p.m. to 6 p.m. and Saturday and Sunday, 9 a.m. to 6 p.m. Visitors can watch maple syrup being made, usually between January and March. In the off season, the farm sells homegrown canned goods, wreaths and homemade pies to order by Denning's wife, Lynne. Organic eggs and wood are also for sale. * A maple grove that is tapped is called a sugarbush.